A CLAN LINER OF 6,843 TONS GROSS, the Clan Macdougall is driven by an eight-cylinder diesel of the four-stroke-cycle double-acting type. A vessel with a raked stem and cruiser stern, the Clan Macdougall was built at Greenock in 1929. She has a length of 454 feet between perpendiculars, a beam of 62 ft. 4 in. and a depth of 28 ft. 11 in. The Clan Macdougall is registered at Glasgow. YEAR by year the tonnage of motorships under construction and in service is steadily mounting, and it is possible that eventually the oil engine will dominate the trade routes of the world. The application of oil engines to use in the Mercantile Marine is worthy of special consideration. There are many different classes of vessel covered by the term “motorship”, and every type has its special uses and its advantages over steam-driven rivals of similar tonnage. Apart from the special purposes for which oil-engined vessels are eminently suitable, there are some features of motorships that are of unusual interest - for instance, the enormous size of their engines, problems of power transmission, auxiliary machinery and other considerations. The steam marine engine was tried out in many forms before the vertical type, with inverted cylinders, was adopted as standard for screw-driven vessels propelled by reciprocating engines. It is the vertical type of oil engine that is universally used in motorships, and the number of cylinders, the number of engines and their arrangement depends on the requirements of the vessel equipped. 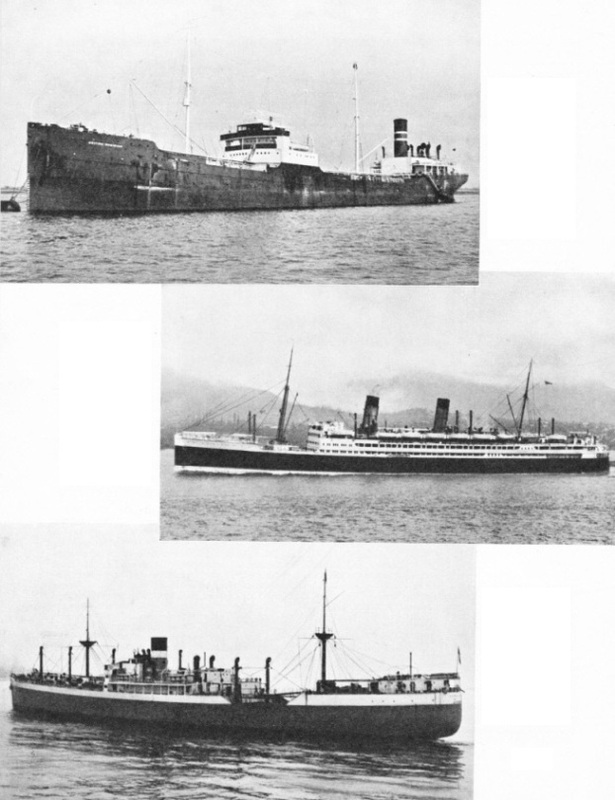 The first, large diesel-engined passenger liner was the Aorangi. This vessel was built by the Fairfield Shipbuilding and Engineering Company, Glasgow, and was completed in December 1924. The Aorangi is of 17,491 tons gross, and was designed for a speed of 17 knots on the service between Australia and Vancouver. The liner is propelled by quadruple screws driven by four sets of Sulzer diesel engines, each of 3,000 brake horsepower, with cylinders of 27½-in diameter and 39-in stroke, working at 125 revolutions a minute. The sets are of the six-cylinder single-acting two-stroke-cycle type. The four sets are arranged side by side, separated by narrow gangways, in one main engine-room - a concentration of energy totalling 12,000 horsepower. The control positions are level with the top platforms at the after ends of the engine sets. An idea of the size of these and of similar engines may be gathered from the fact that it is necessary to provide two or even three tiers of steel platforms in the alleyways between adjacent sets. Between these platforms there is usually a distance of 8 to 10 feet. Forward of the main engine-room is that allocated to the auxiliary machinery, which is a specially interesting feature of motorship operation. In the Aorangi the auxiliary machinery is driven partly by steam and partly by electricity. Auxiliary machinery such as air pumps, bilge and feed pumps were originally worked from the pistons or crossheads of the main engines. The driving of auxiliaries in a motorship presents a number of problems peculiar to the operation of oil engines. In some smaller types of diesel engine the compressed air used for starting and manoeuvring is obtained from pumps driven by the main crossheads. Where two-stroke cycle engines are used, important auxiliaries are the scavenging pumps that force the burnt gases from the cylinders at the end of the working stroke and recharge with fresh air. Such pumps are, in some types of engine, driven from the main crossheads. In the Aorangi the scavenging air is supplied by a set of three turbo-blowers driven by electric motors. Electric current for these blowers and for the bilge, sanitary and engine-cooling water pumps, is generated by four 410 horsepower sets driven by four-cylinder Sulzer engines at 200 revolutions a minute. Steam is used for driving some of the bilge-pumps, ballast, fresh water and general service pumps and the lubricating and fuel oil pumps. Steam is used also for driving an emergency air-compressor, an auxiliary electric generating set, and the fuel, feed, and other pumps for the boilers. There are two boilers of the Scotch type with a combined heating surface of 3,500 sq. Ft.
maintaining a head of steam by the diversion of hot exhaust gases from the oil-engines. A DIESEL-ENGINED OIL TANKER of 6,983 tons gross, the British Dominion was built at Newcastle-on-Tyne in 1928 for the British Tanker Company Ltd. She has a length of 440 feet between perpendiculars, a beam of 57 feet and a moulded depth of 34 feet, with a draught of 27 ft 9½-in. Oil engines are being used in increasing numbers for the propulsion of oil tankers. The British Dominion’s single screw is driven by a Doxford four-cylinder diesel of the two-stroke-cycle opposed piston type developing 2,000 horse-power. THE FIRST DIESEL ENGINED LINER of considerable size was the Aorangi, built at Glasgow in 1924, for the service between Vancouver and Australia. A quadruple screw vessel of 17,491 tons gross, she is propelled by four sets of Sulzer six-cylinder diesel engines, each of 3,000 brake horse-power. The cylinders are of 27½-in and a stroke of 39-in. With a straight stem and a cruiser stern, the Aorangi is 580 feet long, with a beam of 72 ft 2-in and a moulded depth of 46 ft 7-in. She belongs to the Canadian-Australasian Line. A MODERN MOTOR VESSEL of 6,588 tons gross, the City of Lille was built at Glasgow for the Ellerman Lines. She is driven by a four cylinder diesel of the two-stroke cycle opposed piston type, with cylinders of 26¾-in diameter and 107-in combined stroke. The City of Lille, registered at Liverpool, has a length of 447 ft 8-in, between perpendiculars, and a beam of 57 ft 11-in, with a moulded depth of 33 ft 11-in, and a corresponding draught of 28 ft 7-in. In motor passenger ships steam was formerly used for cooking, heating domestic water and air-conditioning plant, and for similar purposes. Steam also formed a cheap and reliable medium for the operation of hoists and other deck machinery and for steering. For working winches and similar machinery in motorships, one system of operation has been tried that uses neither direct steam drive nor electricity. In the Dutch motorship Rhea an interesting system was installed for working the deck winches. These were arranged for driving by a longitudinal shaft running the whole length of the vessel alongside the cargo hatches. At each set of winches was a transverse shaft, driven by bevel gearing from the longitudinal shaft, that transmitted the power through friction clutches. The longitudinal shaft was driven by a steam engine in the main engine-room. In addition to passenger liners, another type of motorship that is generally provided with steam plant for auxiliary purposes is the oil tanker. In vessels of this type the pumps for handling the oil are most conveniently driven by independent steam engines. Further, the oil cargo in cold climates becomes viscous and difficult to pump. To overcome this difficulty coils of piping are placed in the cargo tanks and steam is used to heat them. There is another, and rather unusual, reason for using steam in motorships, especially those engaged in the oil trade. In ships propelled by diesel engines there must be a supply of compressed air for starting. Compressed air was once used for driving turbine-operated auxiliary machinery, but there were two objections to the use of air alone in this manner. First, the size of the compressors had to be extremely large to supply the additional volume of air, and in addition there was a danger of the exhausting air “freezing up”. This production of cold when compressed air is released is the counterpart of the heating that takes place on compression. These difficulties were overcome by mixing the supply of compressed air with steam. The Aorangi has accommodation for nearly 1,000 passengers and some 330 officers and crew. It is the passengers that have decided the rather vexed question of funnels. A ship is not a ship without a funnel in the estimation of the average traveller by sea. But funnels in motorships appear to be used for almost any purpose but the discharge of smoke. In a diesel-engined vessel one funnel is required to enclose the engine’s exhaust pipe and sometimes it accommodates the silencers as well. Additional funnels are, however, used to afford cover to all kinds of structures from wireless cabins to dog-kennels or stores for deck chairs. The modern tendency, however, is to eliminate funnels as far as possible. Some shipping lines have broken away from tradition and their large motorships appear without any smoke stack except for an abbreviated shaft resembling a ventilator without its cowl. In the passenger liner Aorangi we have seen the method adopted in arranging the four engines for the driving of quadruple screws. Other types of ships, however, call for different arrangements in the engine-room. The space problem occurs in an acute form where the machinery is placed right aft, as in oil tankers and other ships that carry cargo in bulk. By choosing the more compact types of engine, however, difficulties involved in arranging the engines and auxiliaries can be overcome. In some ways the motorship with engine-room aft offers the best cargo-carrying capacity. There is one factor in ship propulsion that sets a problem for the marine engineer. The marine steam turbine, for example, must run at a high speed to attain its maximum efficiency. The most efficient speed for the screw propeller is considerably lower, and the difference between the two speeds is overcome by the use of gearing. Similarly in motorships gearing has been used to supply the transmitting medium between the source of power and the ship’s propeller. The use of mechanical transmission in the form of gearing has a number of advantages for motorships. In the first instance the use of gearing gives the necessary reduction in engine speed. A number of comparatively small high-speed engines are sometimes coupled together by gearing to drive a single propeller. Used in this manner they have certain advantages over a single oil engine of large dimensions. Heat stresses are kept within reasonable limits and in the event of failure in one engine the unit can be disconnected readily for repairs. In most forms of mechanical transmission by gearing it is usual to interpose a flexible coupling between the gearing and engine to withstand shocks. THE FIRST BRITISH DIESEL-ELECTRIC PASSENGER VESSEL was the Lochfyne, built at Dumbarton in 1931 for MacBrayne’s services between the Hebrides and the mainland of Scotland. A twin-screw vessel of 754 tons gross, she is driven by two sets of four-stroke-cycle single-acting diesels connected to electric motors. The Lochfyne has a length of 209 ft 11-in, a beam of 30 ft 1-in and a depth of 7 ft 11-in. In addition to gearing there are two other principal methods, apart from direct drive, of transmitting the engine power to the propeller. Either method, generally used with gearing, is equally applicable to steam or internal combustion engines. One system uses a fluid as the “connecting link” between the engine and propeller. The other system is electric. One fluid transmission system uses a combination of gearing and hydraulic clutches that serve also as a means of reversing where non-reversing oil engines form the motive power. In nearly all instances, however, the larger marine diesel engines are reversible. It is the electrical system of transmission, however, that has been adopted for marine use, not only in motorships, but also in some of the largest vessels powered by steam turbines. Among such ships equipped with steam turbines are the Normandie and a number of large warships in the United States Navy. Diesel-electric drive is a system that has been widely adopted for purposes other than the driving of ships and the great diesel-electric locomotives of the Canadian Pacific Railway provide an illustration of this type of power plant. Among the first electrically propelled ships was the Electric Arc, equipped in 1911 for demonstration purposes. The vessel was 50 feet long and was fitted with an internal combustion engine, of 45 brake horse-power, which drove a dynamo. The dynamo drove an electric motor coupled to the propeller shaft. The Electric Arc was tried on the Clyde with complete success and she attained a speed of 8 miles an hour. Valuable data were obtained from the trials of the Electric Arc, and in 1913 a much larger vessel was fitted with diesel-electric drive. This ship was the Tynemount, built by Swan, Hunter and Wigham Richardson for service on the Great Lakes of North America. She was 250 feet long, with a deadweight capacity of 2,400 tons. Her engines comprised two six-cylinder, 300 brake horse-power diesel engines, driving three-phase electric generators. The two generators supplied current to the auxiliary machinery and a three-phase motor of 500 shaft horse-power that drove the single screw. The engine-room was arranged aft. 90-kilowatts generator, for the supply of current to the propelling motors. Another interesting ferry boat is the Canadian Pacific Motor Princess, built of wood in 1923 and used for the conveyance of motor cars and their occupants. The vessel is fitted with two screws driven by a pair of 600 horse-power diesel engines. Another type of ship to which the oil engine has been applied successfully is the coasting vessel, and many coastal motorships are to be found in all parts of the world. The diesel engine has come into prominent use in Holland for shallow draught vessels on the canals and on the Zuider Zee. An interesting motorship of this type is the W. F. van der Wyrk, 202 feet long, but with a draught of only 6 feet. She is fitted with two 500 brake horse-power Kronhout oil engines and carries 2,000 passengers. The tug is yet another type of ship in which the diesel engine is being fitted, especially in Holland and Germany. An 80-feet Dutch tug, the Lucienne, built at Rotterdam in 1920 and later bought by a dock company in Vancouver, was fitted with a single set of 420 horse-power Sulzer engines. In 1923 she made the voyage from Rotterdam to Vancouver in fifty-two days - a splendid exhibition of the excellence of her engines. Many famous private yachts are powered by diesel or semi-diesel engines and the oil engine is nearly always used where auxiliary power is required in sailing ships. Lightships, fishing vessels and dredgers are among other craft that make use of the compact and convenient oil engine. One of the first motor-driven vessels in the world was the Selandia, belonging to the East Asiatic Company. She went into service in February 1912. In the closing months of 1936 she was sold by her original owners, not for scrap, but for long-term work under the Norwegian flag, a duty for which that country’s fleet is particularly suited. The Selandia was among the first of what we would now call cargo liners, and was one of the earliest ships to have electric deck auxiliaries. Her gross tonnage was 4,900. She had two eight-cylinder diesel engines and developed just under 2,000 horse-power on sixteen cylinders, i.e. eight cylinders for each shaft. To-day in some experimental engines this power can almost be developed in a single cylinder. A nother early motor vessel was the tanker Vulcanus, owned by the Asiatic Petroleum Company, and this little ship of 1,179 tons gross, built in 1910, has been scrapped. It is, however, only her hull which was worn out through the continued carriage of crude oil distillates. The engines are still functioning perfectly in a power station ashore. Some of the earliest motor vessels of all ran on the River Volga. These well-designed craft anticipated many of the developments which we are accustomed to regard as commonplace to-day. 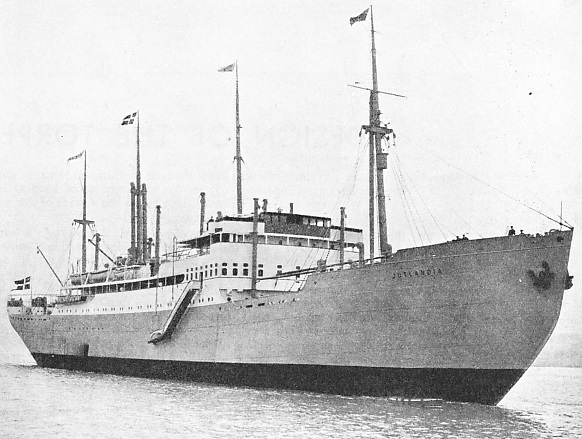 A DANISH MOTOR VESSEL of 6,153 tons gross, the Jutlandia, was built in 1934. She is a twin-screw ship, with a length of 436 ft 9-in, a beam of 61 ft 2-in and a moulded depth of 36 feet. She is propelled by Burmeister and Wain ten-cylinder diesels of the two-stroke cycle single-acting type.